News - How to Apply Adhesives? Perhaps you have experienced problems with poor bond strength? The following is a best practice methodology for producing superior bonding. Clean the surfaces by solvent-wiping any deposits of heavy grease, oil, dirt, or other contaminants. The surface can also be cleaned with industrial cleaning equipment such as vapour phase degreasers or hot aqueous baths. If working with metal, abrade or roughen the surface to significantly increase the microscopic bond area and increase the bond strength. 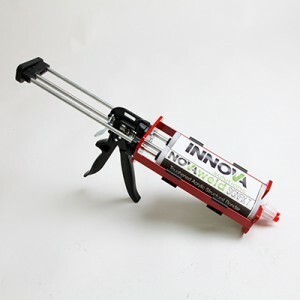 First, attach the cartridge to a 50ml or 400ml manual or pneumatic dispensing system. Open the tip then ‘burp’ the cartridge by squeezing out some material until both sides are uniform- this ensures no air bubbles are present during mixing. Attach the mix nozzle to end of cartridge. Apply to one surface and attach the other substrate quickly, as you only have a few minutes of working time to use the product. Substrates can be clamped with a bond line thickness as small as 0.007″. If you are using the adhesive to attach big head fasteners, first, gun out a small worm cast of adhesive, large enough to accommodate the base of the fastener, then push the fastener down into the adhesive, turning gently. Take care not to push the fastener too far down, thereby squeezing the adhesive from underneath. Click here to link through to our adhesive product range.